Another addition to our growing collection of natural stone candleholders is this White Selenite Round Candleholder from Morocco. They stand between approximately 3" - 3.5" tall. These are products of nature so shape and size will vary. 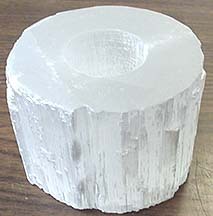 Selenite Soothing Stones from Morocco. These Soothing Stones are fully polished, shaped like a small oval, and measure approximately 2.5"L x 2"W x 1"H.
Available in White and Orange Selenite. Extra Large-About 3.75" across and 4.5" long. Straight Selenite Wands are another addition to our growing collection of natural stone items. Our Wands come from Morocco. The Straight Selenite Wands come in 2 sizes. The Small measures approximately 3"-4" long. The Large measures approximately 5"-6" long. This Selenite Massage Wand has been polished all over with rounded ends. Because of the Selenite fibers this item is not recommended for children under 12. Sold by each. NEW SIZE!!! Stand not included. Our Selenite Sphere's are now available in 4 sizes! The Extra Small sphere measures approximately 1.5" in diameter and cost $3.00 each. The Small Sphere measures approximately 2"-2.25" in diameter and cost $5.00 each. The Medium Sphere measures approximately 2.5"-3" in diameter and cost $8.00 each. 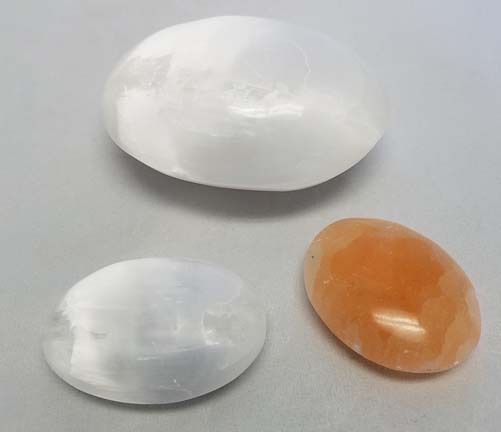 The Small and Medium Spheres are available in Orange and White Selenite. The Large measures approximately 3.5"-4" in diameter and cost $15.00 each for the White and $12.00 for the Orange (not pictured).